A House for More Than One Kind of President: Hollybush Mansion ~ The History Girl! Rowan University in Glassboro, New Jersey is a growing campus. New academic buildings and housing is going up as the University increases enrollment. However, tucked away along the edge of the sprawling campus is a stone house with manicured gardens and lawns. The oldest building on the campus, the former Whitney Mansion, now called Hollybush Mansion, is significant locally and globally. Once a private home to a well-known south Jersey glassmaking family, it is now partially restored and tells the story of the community's founding and the formative years of the normal school at Glassboro, but also the important meeting between two world leaders which took place there in 1967. Hollybush Mansion was built by Thomas Heston Whitney (b. 1813 - d. 1882) in 1849 on a 100-acre property. The home is constructed of South Jersey ironstone, locally quarried from the Chestnut Branch of the Mantua Creek. It is designed in the style of an Italian-style villa and features wide overhanging eaves and a tower. Originally, the home also featured a winding driveway with a gate and landscaping to create a park-like atmosphere. Inside the home, the first floor rooms feature trompe l’oeil artwork on the ceilings and intricate plaster frieze moldings in the library and formal parlor. Thomas and his brother brother Samuel A. Whitney (b. 1819 - d. 1890) owned the Whitney Brothers Glass Works, which was located in Glassboro and became the largest and most successful glass operation in South Jersey. At the company's height, over 400 were employed and the site included flour and feed mills, a sawmill and planing mills, blacksmith shop, and 1,000 acres of farmland. Detail of the artwork and plaster frieze in the library at Hollybush Mansion. After Thomas' death in 1882, the home was left to his wife, Josephine Allen Whitney. Josephine died in April 1908, leaving Hollybush to her eldest son, John. The home remained in the family until 1916, when the home was mortgaged to John A. Ackley of Vineland. Ackley was a developer who sought to subdivide the land. In the early 1920s, local Glassboro residents raised over $7,000 to purchase twenty-five acres of property to construct a school for teachers. The property included the former Whitney Mansion. The property was offered to the state free of charge if a normal school was to be built there. In 1923, the Glassboro Normal School opened to 236 students. Some of the students would reside in Hollybush, which was partially converted to a dormitory. The center hall at Hollybush Mansion. The school's Presidents occupied the first floor rooms of the house, while the upstairs rooms were used as dormitory space. The last president to reside in Hollybush was Dr. Herman James, who along with his family, occupied Hollybush until 1998. 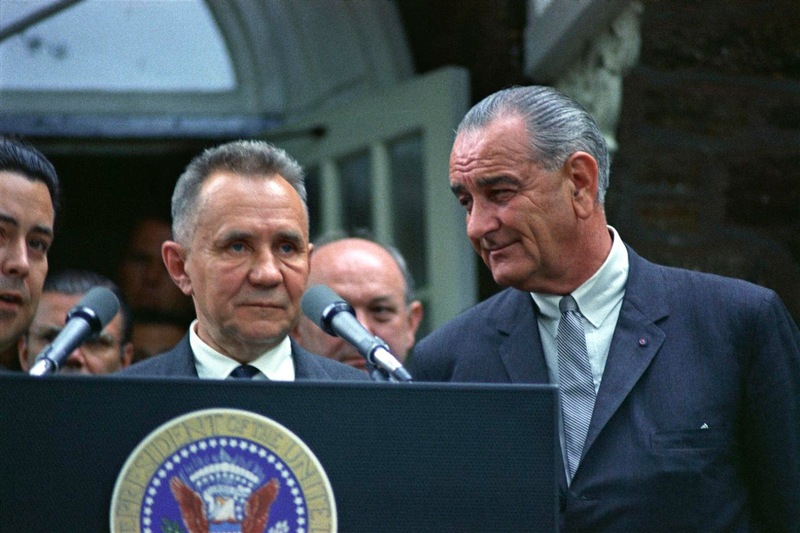 In June 1967, the mansion hosted the Glassboro Summit Conference, a summit meeting between United States President Lyndon B. Johnson and Soviet Union Premier Alexei Kosygin. Kosygin was in New York to address the United Nations and President Lyndon B. Johnson asked New Jersey Governor Richard J. Hughes to suggest a neutral site for a meeting to avoid a possible confrontation between the United States and the Soviet Union in response to the Arab-Israeli Six-Day War. Glassboro was offered because it is located approximately halfway between New York and Washington. With only sixteen hours notice, Hollybush Mansion, home to Glassboro State President Thomas Robinson and his wife, Margaret, was to be converted from a home to a high-security meeting place between two powerful world leaders. Glassboro did not have much time to prepare for this monumental event. Within a matter of hours, members of the secret service, news reporters, government officials, and workers descended upon Glassboro and spent day and night preparing the community for the arrival of the two world powers. The State Highway Department installed eight miles of snow fence and cyclone fence around the campus. Local residents offered their homes to reporters and the college gymnasium became headquarters for the media. On June 23 and 25, Johnson and Kosygin spent more than seven and a half hours in the home's library discussing ways and means to head off nuclear war. Also meeting at the house were Soviet and American statesmen: Foreign Minister Andrei A. Gromyko, Ambassador Anatoly Dobrynin, Dean Rusk, Robert McNamara, McGeorge Bundy and W. Averell Harriman. At the end of the meetings, it was deemed a success and tensions were eased, for the time being. The room where President Lyndon B. Johnson and Soviet Union Premier Alexei Kosygin met in 1967. The first day of the summit only attracted about 3,000 spectators but once word spread, the third day's crowd was estimated at between 15,000 - 18,000. Throughout the three-day span, only one trespasser was detained and spent the day shackled to a beam in the Carriage House adjacent to Hollybush. One of the more interesting stories is about a piece of furniture in the house - two chairs used by President Johnson and Premier Kosygin. Although the White House brought many furnishings, china, and other items to stage the house, two chairs, heirlooms of Margaret Robinson, were left behind in the library. At the end of the Summit, all the furniture was removed, including the two chairs. Thinking it was a mistake, Margaret Robinson contacted the White House about their return, since they meant much to her. She was told that they were now historic chairs and were to be featured in an exhibit in Washington, D.C. After a few months, she once again inquired, and two replica chairs were produced by White House carpenters and sent to Glassboro. These chairs still remain in the Robinson family and hopefully one day will return to Hollybush. Hollybush was listed on the National and New Jersey Registers of Historic Places in 1972. Since 2003, Rowan University has spent more than $3 million to restore the mansion. The restoration has been sensitive to historic features of the home, including decades of graffiti in the attic. The earliest graffiti on the walls and ceiling was created using candle smoke and dates to the late 1800s. Later, students added their own initials and years in paint and pen while staying at the house when it was used as a dormitory building. Candle smoke graffiti in the attic at Hollybush Mansion. The restoration work has also included replacing the roof with slate similar to that used for the original structure; stabilizing the foundation; installing new heating, ventilation, plumbing and electrical systems; repointing stone; reinforcing the tower; refurbishing stained glass windows; and restoring and conserving significant decorative features. Another unique feature is the cistern in the attic. Accessible by a small door, a sizable wooden container, in which a liner was once installed, supplied water to the household, fed by water from a nearby pond. Despite all of the work that has been done to date, there remains much work to do at Hollybush, including the multiple second floor bedrooms and passages awaiting restoration.